“Breadcrumbs” – Henry grapples with an important decision when a job prospect in New York threatens to take him away from Jacinda and Lucy, but a revelation in the case of The Candy Killer could make it even harder to leave Hyperion Heights. 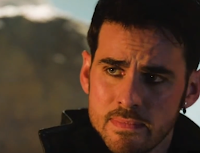 Meanwhile, Margot confides in Tilly, and in a flashback, Hook helps Henry find a way to prove himself to Ella, on “Once Upon a Time,” FRIDAY, APRIL 6 (8:00–9:01 p.m. EDT), on The ABC Television Network, streaming and on demand. “Once Upon a Time” stars Lana Parrilla as Regina/Roni, Robert Carlyle as Rumpelstiltskin/Weaver, Colin O’Donoghue as Hook/Rogers, Andrew J. West as Henry Mills, Dania Ramirez as Cinderella/Jacinda, Alison Fernandez as Lucy, and Mekia Cox as Sabine/Tiana. Guest starring in this episode are Rebecca Mader as Zelena/Kelly, Rose Reynolds as Alice/Tilly, Tiera Skovbye as Robin/Margot, Nathan Parsons as Nick Branson/Jack, Chrispher Gauthier as Smee and Charles Mesure as Blackbeard. “Breadcrumbs” was written by Jane Espenson & Jerome Schwartz, and directed by Ron Underwood.